Could you please take a few seconds of your time to vote here? Share the link on your Facebook profile and spread the word around. Please make sure that that the '10 votes' change to '9 votes' in order to ensure that your vote was logged in. Arms Wide Open Childhood Cancer Foundation is working closely with scientists, researchers and doctors; who are pioneers in the pediatric cancer field, who are on the forefront of bringing many alternative therapies into clinic which could prolong the lives of children diagnosed with Neuroblastoma until a cure is funded. Right now only 30% of children diagnosed with Neuroblastoma will survive, but because it is an "orphan" cancer, research funding is limited as pharmaceutical companies do not see the efforts as profitable. Recognizing that children should not be viewed as a profit, but, rather, our investment, Arms Wide Open raises money for alternative therapies and actual treatments these children so desparately need in order to survive. Due to the progression of cancer to Charmaine's knee, she has to undergo higher doses of radiation which could stunt her growth. Pls help to vote for less toxic therapy for cancer kids. Go to my pofile page share the link and vote for it every day. It just takes a few sec. We're racing against time. Closing date is end sep. Thank u.
Bumping this up again. It went up to 2nd place thanx to everyone's support. However, it slipped to 3rd place today. Please continue to vote every day so that cancer kids could receive the funds for less toxic therapy. Only the top 2 idea get funded. Please vote and share this on your FB profile. 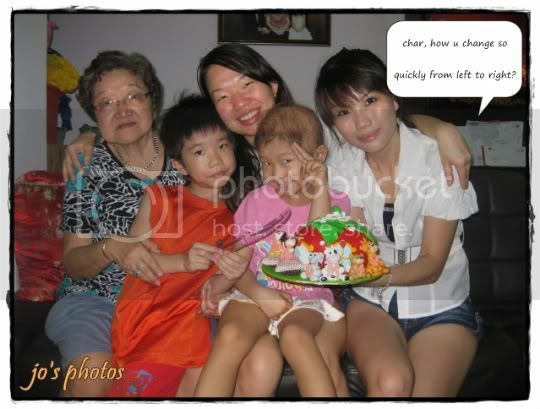 Pls do this for me, for my god daughter Charmaine, for one of my bestest pal Cyn the mother of Charmaine. Thanx a million! MSN video from just now. Char was bored in the hospital waiting to be given chemo. She was improvising play and was making lots of stuff with wet wipes. There was once it felt as if she was showing me magic tricks, telling me to look at the paper and see it "disappear". I had tissue over at my side so we pretended to pass our tissue through the camera. It was really hilarious. Cyn mommy went downstairs to the common kitchen to prepare dinner while I entertained charmaine. Dunno is it I entertain her or she entertain me but she left me hanging there like a needy chick faced with an empty room on the screen when she said, "Bye bye I'm going downstairs to the playroom now." 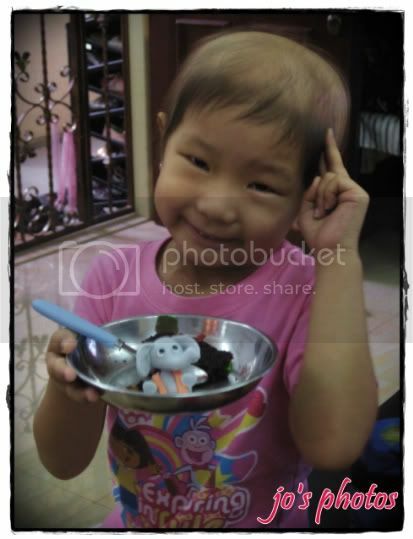 Charmaine's cancer has progressed to her left femur. 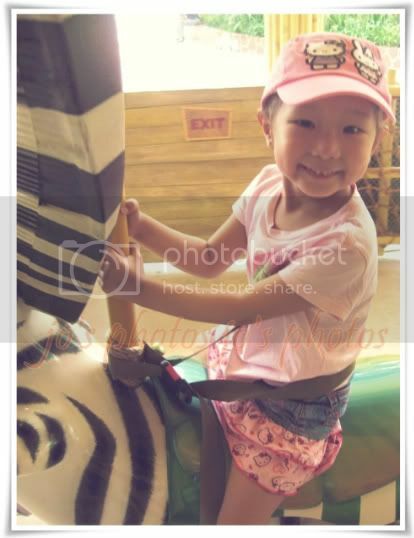 The only treatment for this seems to be a very strong dose of chemo which has only a few days ago took the life of a little boy almost parallel in terms of diagnosis and treatment to Charmaine. Cyn is devastated and has been crying. Earlier in the afternoon, I just told cyn to keep us updated on the results of the report. There was no sms; no news. No news meant good news I presumed. There I was enjoying my off day buying presents for my students from the graduating classes and for children's day, meeting my frenz for dinner in town and enjoying my close neighbour's company while chatting and savouring mooncakes under her pavilion thereafter. All this while, I thought that everything's gonna be ok.
Why is it that it's not working as well now? I really believe in positive thinking and power of the mind. That's how I keep myself happy. That's how people think I'm always positive and happy even when I'm bleeding inside. I read and learnt of so many true accounts on how positive thinking could even result in miracles such as curing cancer. But when the mind is so drained, can one even think positive thoughts? No matter what, you have to. I'm so tired. It's rare for an insomniac to say that at this time. But I'm tired and I'm gonna sleep and it'll be a bright and cheery day when I wake up and I'm sure it would work. 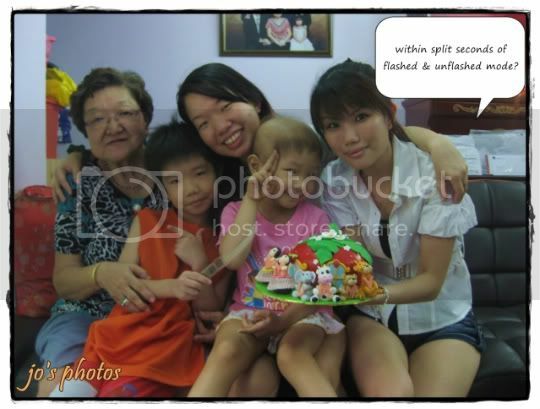 We had a mini mother's day celebration for Cyn mommy after Charmaine was discharged that morning. It was a packed day coordinating to meet dear Kellie for the cake, zipping down to cyn's place in the afternoon and meeting my own family for our mother's day dinner in town. 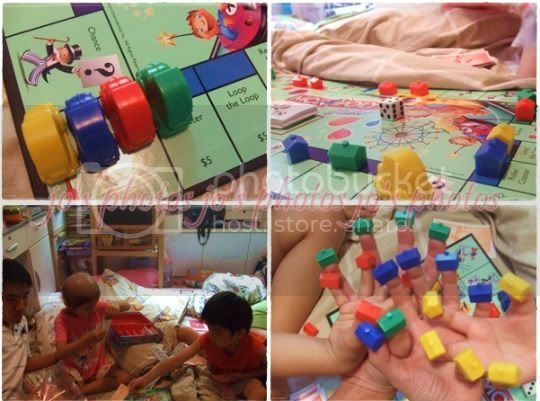 The kids taught kh and me how to play Monopoly Junior. They were really good at counting and remembering most of the rules but they were such sore losers. 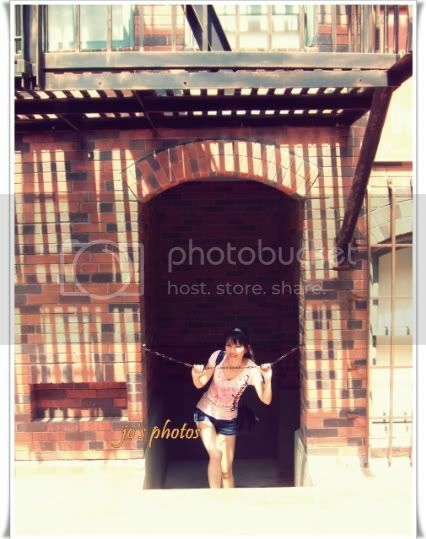 Haha... I was the one who went bankrupt in the end but there they were complaining about having to give money to kor kor or to mei mei so often. Haha... I felt like smacking them and cyn said she disliked playing the game with them coz they just didn't like to lose. *LoLz* Kids will be kids. After lunch, it was time for lots of photo-taking of the cake... We spent so much time taking photos of the cake and not bearing to cut it. The animals and dolls holding the words saying "We love Mummy". We're finally cutting the cake after we felt we had enough photos of it. 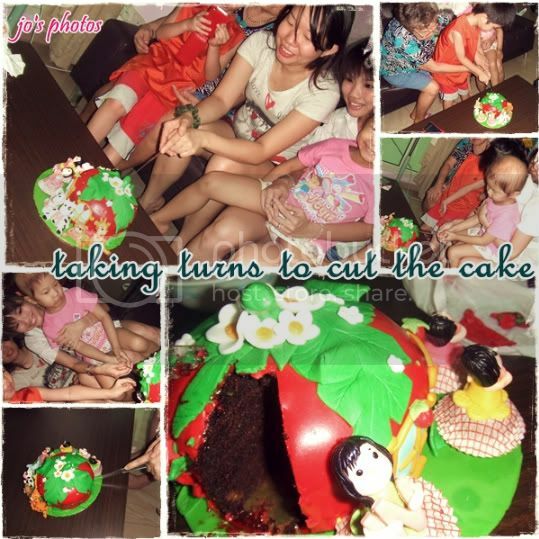 The cake was the product of the goodwill of two of ourfeistyprincess readers Ko Chen and Kellie. 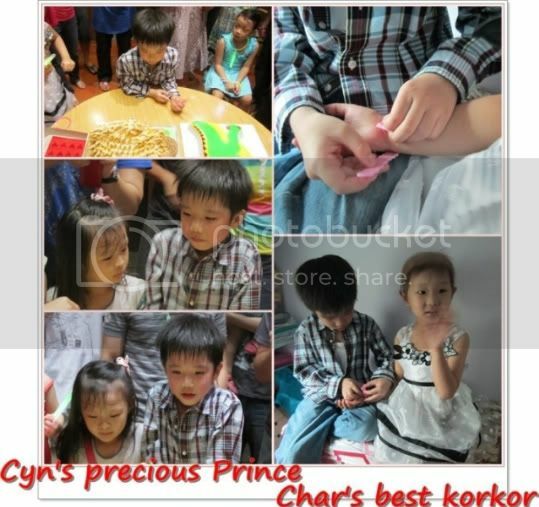 Ko Chen's kind thoughts led to her ordering a cake for Cyn mommy and started coordinating with Kellie. She deemed it a simple act but a simple act goes a long way. I'm always amazed and touched by these human angels on earth. 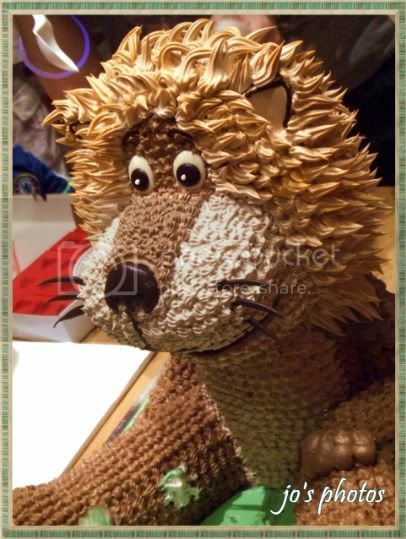 Kellie is the one behind the wonderfully creative cake which received lots of compliments and bewilderment of her craft and skills. 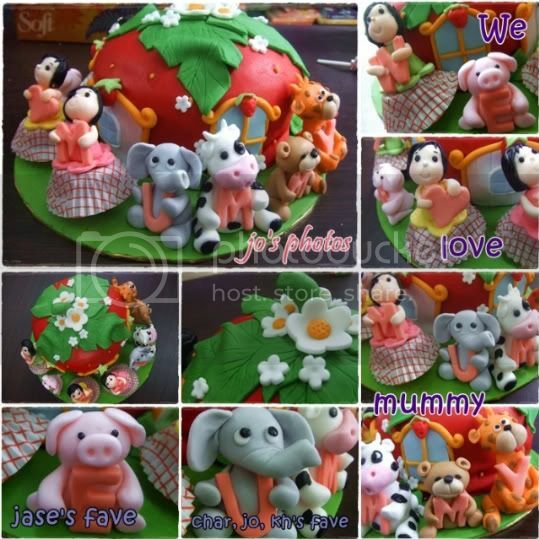 We viewed Kellie's blog [http://aimummy.blogspot.com/] when Ko Chen first emailed us and we were really thrilled by the 3D cakes she has made so far! 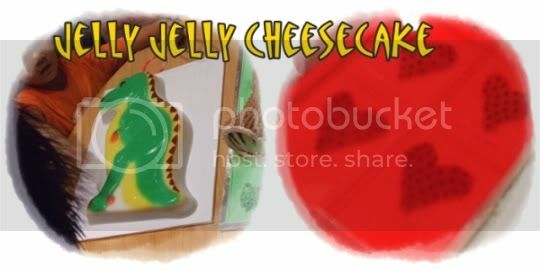 3 nights before Mother's Day, cyn mommy asked Jase and Charmaine what kinda cake they would like mommy to have as a nice aunty was gonna design it accordingly. "I like a strawberry house for mummy. Then must have many animals to say 'Happy Birthday'." I like to have 2 Barbie dolls. One green one pink [I forgot is it one green one pink or one yellow one pink] and with cake all around Barbie. LoLz... cyn and I suspect she was dreaming of her OWN bday cake the previous 2 years. With the 2 kids' input, Kellie conjured up a cake almost true to their words -- a strawberry house with animals "talking" and the dolls representing Barbie. Isn't that so sweet? and lil char char showed how brave she was by downing the unpleasant medicine. 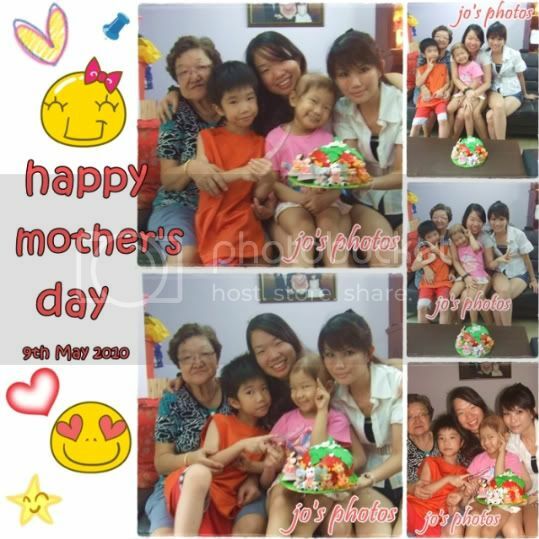 That's how the Lim family spent their mother's day-- Sitting down as a family and having a simple meal at home with a lovely cake to brighten up everyone's day. A few days before Jase's Birthday, Cyn thought of bringing the kids out since char's counts had been quite stable. 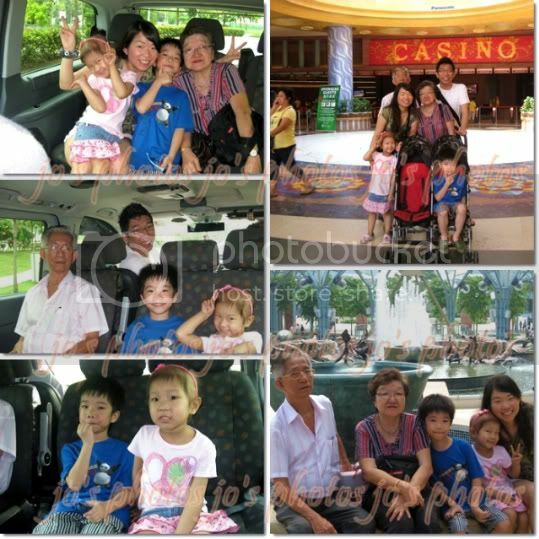 The kids hadn't been on a real outing for some time save for the frequent hospitalisation visits and the occasional "outing" to nearby places to run errands. 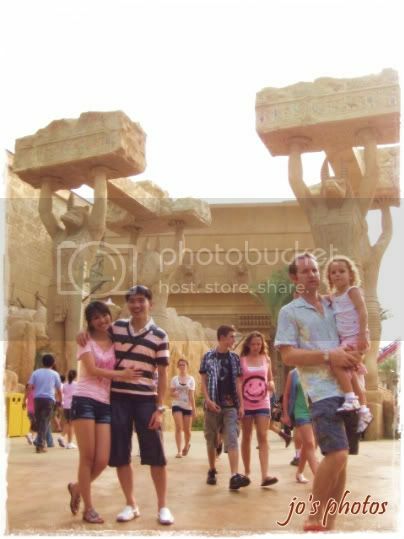 She wanted to bring her whole family out, including her parents, for a fun-filled day. 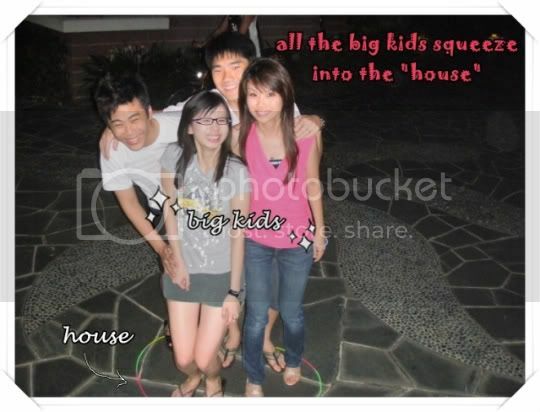 Hence, her brother specially took leave on the day which happened to coincide with my off day! 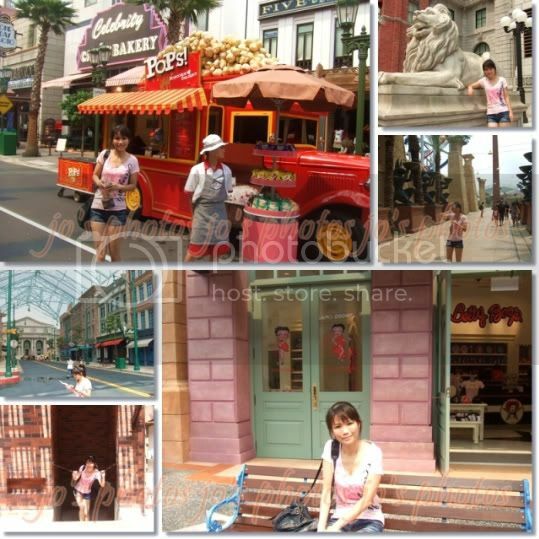 I told her that kh and I would be checking out Universal Studios Singapore (USS) and very quickly we decided to all go together -- as ONE FAMILY. 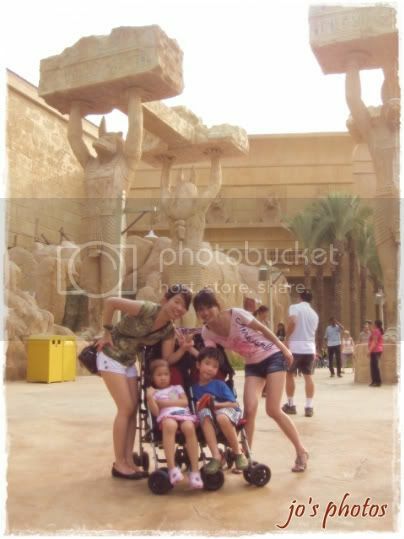 Due to charlene jie jie's expertise, she managed to liaise with USS which made special arrangement for cyn and the kids. In view of char's medical condition, the express pass for 4 was given to cyn. 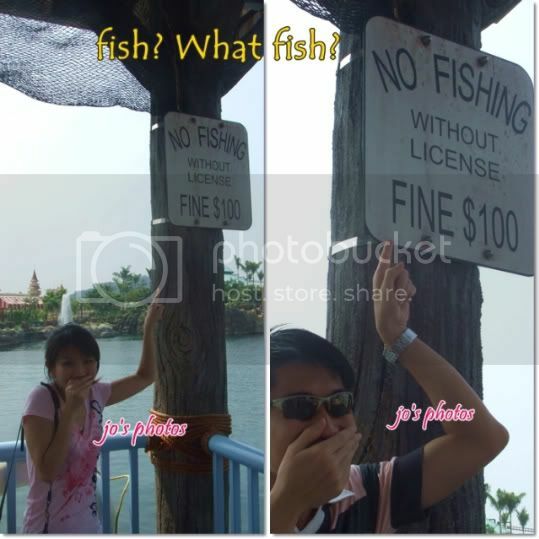 Laughing at the sign for we saw no sign of any fish. 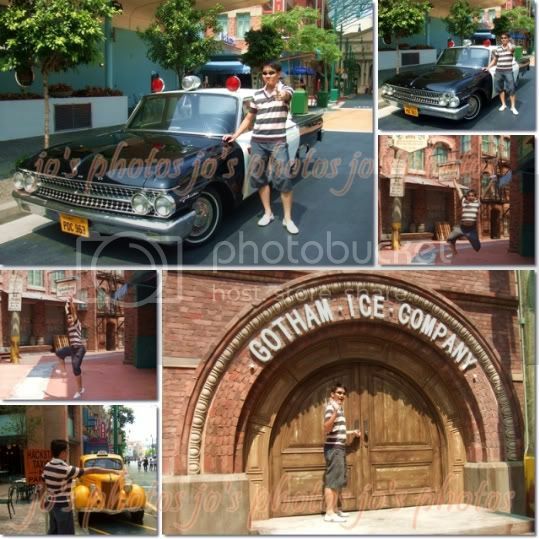 Some random shots of us up and about New York. This reminds me of Where's Wally? We also caught a movie magic special effects show called Lights, Camera, Action: Hosted By Steven Spielberg. 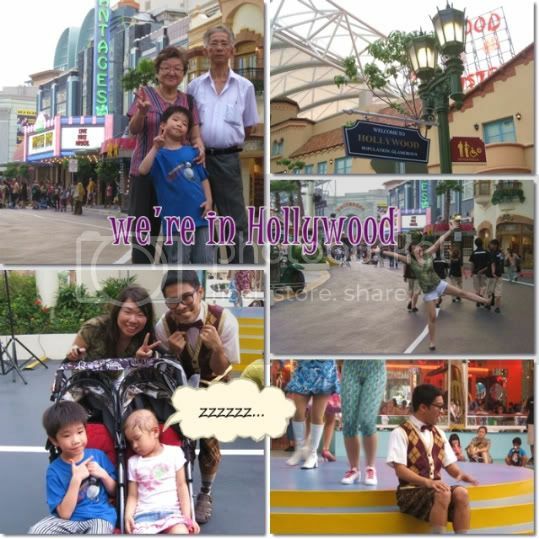 We were simply blown away by the incredible special effects. "Be blown away by incredible special effects as an empty soundstage becomes the setting for a Category 5 major hurricane about to hit New York City. As you stand in a boathouse by the harbor, watch how a calm day suddenly turns stormy. Brace yourself as hurricane-force winds sweep in from the sea and drive a cargo ship and debris towards the boathouse you’re in. Calm soon returns and the damaged boathouse restores itself, all thanks to movie magic." 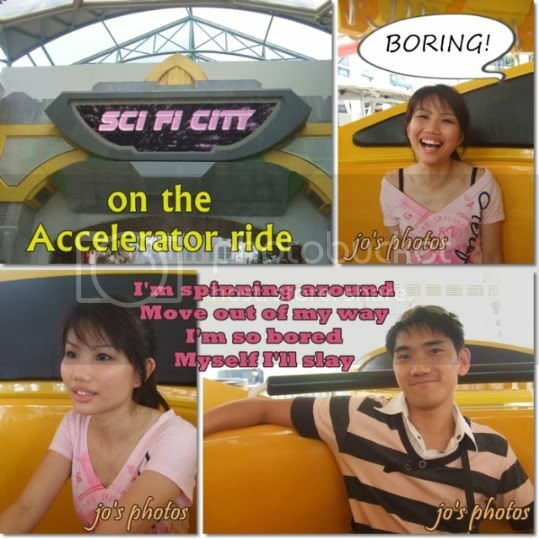 Being thrill rides enthusiasts, the Accelerator at Sci-Fi City was boring for us. 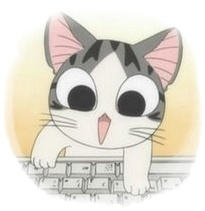 I kept hollering,"BORING~~!" kh wanted to smack me to shut me up. 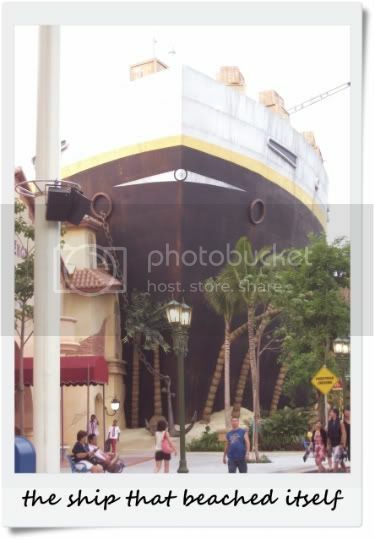 Since the Battlestar Galactica was/is still closed for maintenance, the Revenge of the Mummy Ride took over the position as the most thrilling ride. It is an indoor rollercoaster set in near total darkness. I liked that ride but it wasn't hair-raising at all. 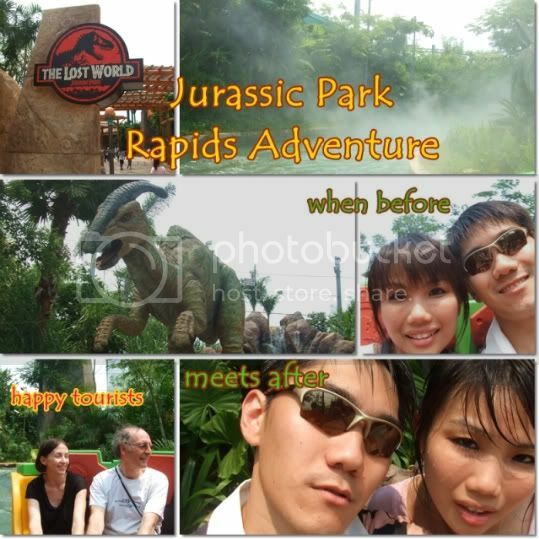 Another contender for thrilling ride is the Rapids Adventure at the Lost World. 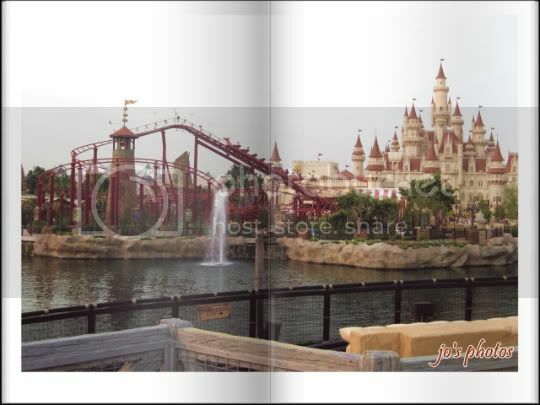 Featuring a white water raft system, thrill-seekers on circular rafts will be tossed along the water channels within the Jurassic Park compound, where prehistoric creatures "roam free". I won't reveal what's in store at the end. 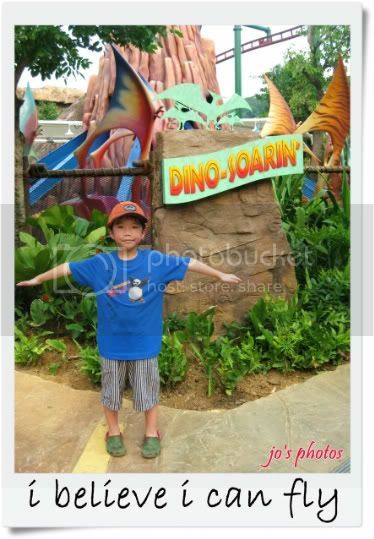 Dun wanna spoil the fun for those who have yet to try the ride. Just remember to bring an extra change of clothes and undergarments if desired. Raincoats were provided but firstly, you would not want to end up looking like a toot and more importantly, they would not help at all! AND... Don't wear shoes! 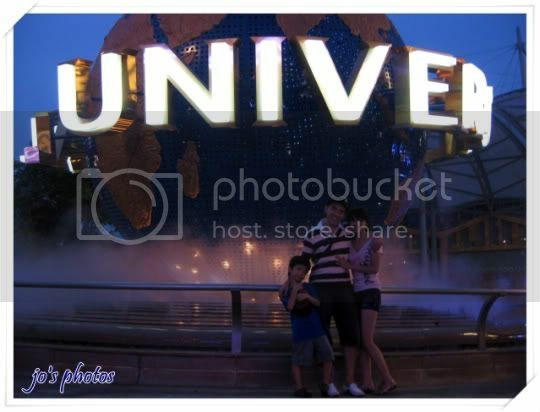 Kh's shoes were spoilt coz of the ride. 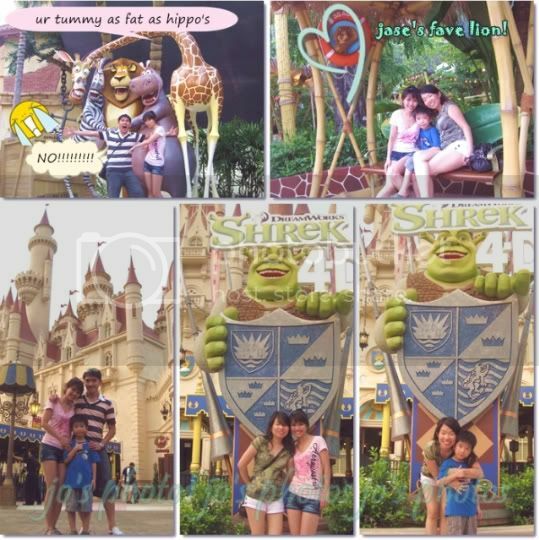 Meanwhile, here's what happened over at the lim family while we were busy checking out USS. 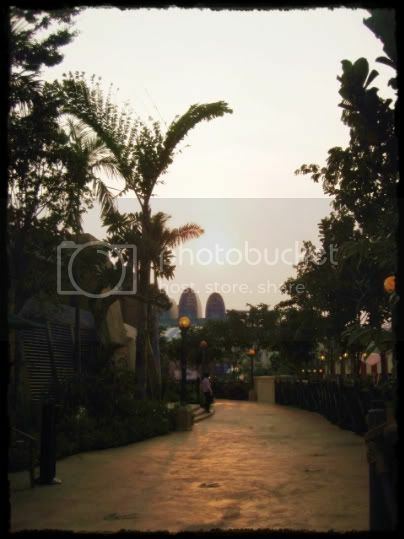 Char was scared of the big fat Kungfu Panda but not by Woody Woodpecker. The kids are generally fearful of huge mascots and would approach them with caution. Jase had fun riding on Alex while char on Marty. We were supposed to meet at the food court but I bumped into Cyn and lil char in the ladies while trying to dry myself under the hand dryer machine as I was still soaking from the Rapids Adventure. We had a quick bite at Casa Del Wild at Madagascar. In my opinion, the food there isn't good at all so skip that place if you can. "Help save Princess Fiona in a totally in-your-face fairy tale adventure. 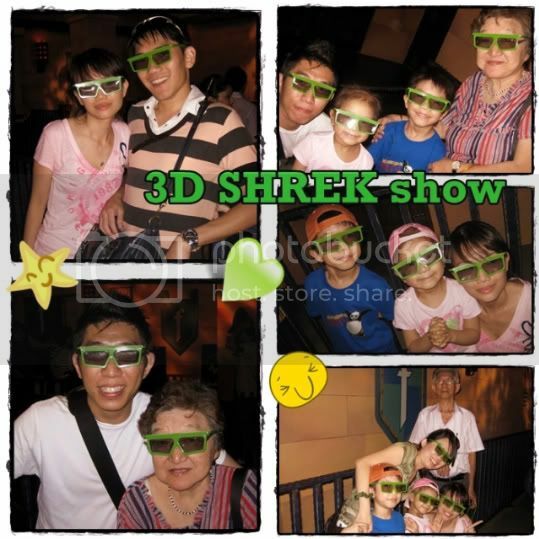 Through the miracle of OgreVision you’ll see, hear, and actually FEEL the action right from your seat!Join Princess Fiona, Shrek® and Donkey on a honeymoon adventure that picks up where the Oscar-winning movie “Shrek” left off, through an original 3-D film, complete with jumps, bumps, bounces, air blasts and water spray that bring the action to life for each guest- with an extra dimension of special effects through the miracle of OgreVision glasses." Magic Potion Spin is an indoor children's ferris wheel located inside the Fairy Godmother’s Potion Shop. I call this the Puss in Boots ride. We were "trapped" in the puss in boots kiddy ferris wheel. Each cabin was really tiny. Since we were cabin #1, we had to wait for the rest of the cabin to be loaded before we started spinning. By then, the kids' were getting fidgety. 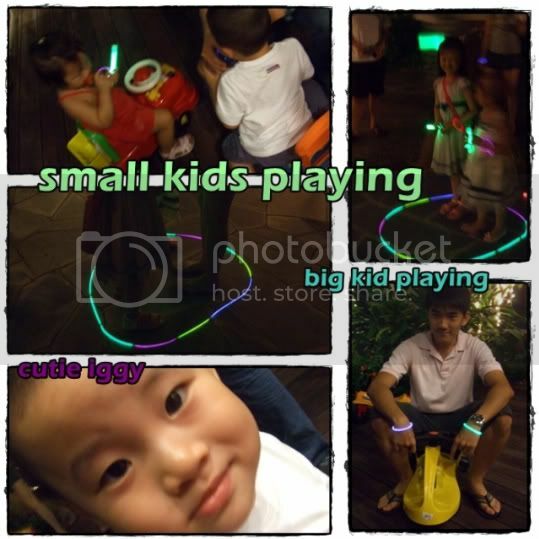 Crazy godma and cyn mommy once again came up with bright ideas to keep the kids occupied. 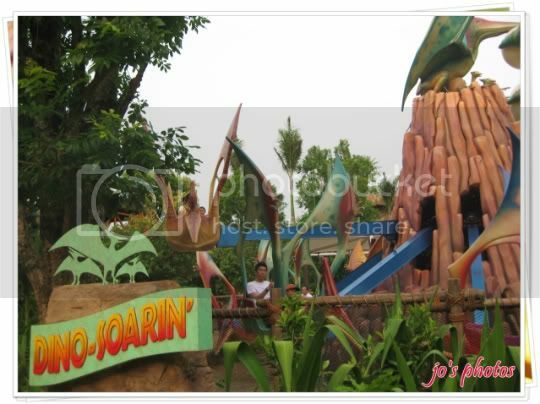 We upped the fun factor of an otherwise ordinary ride and enjoyed ourselves so much screaming at the top of our lungs. Watch what we did in this video. (0:30 onwards) Embarrassed expressions of our loved ones and curious stares from strangers not included. 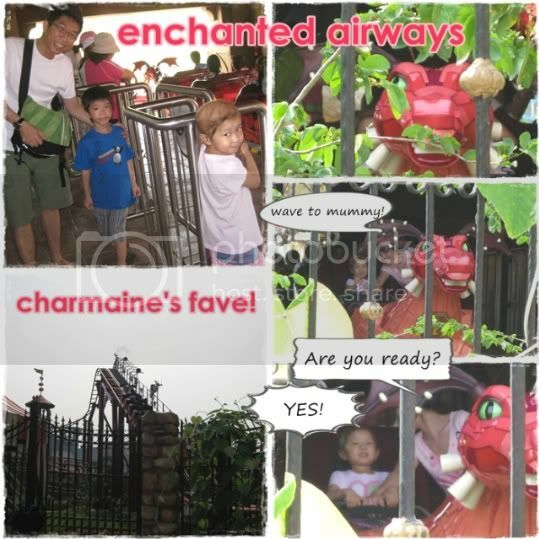 Enchanted Airways was lil char's fave roller coaster ride. While jase was already on the verge of giving up but not wanting to lose to mei mei, char insisted on sitting right in front and going for one round after another. She was the smallest child on the whole roller coaster. For the next few days after that day, she kept asking when she would be able to sit on roller coasters again. That's our feisty little princess. Kh pointed behind me and exclaimed, "Hey dear! That's your shop." I spun around and realised why. 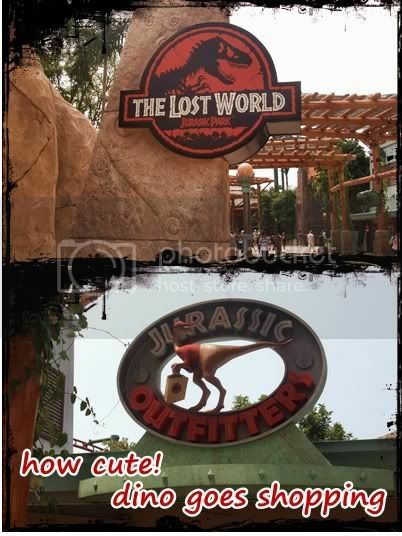 Check out the name of the shop. After that we had snacks at Friar which offered a variety of wraps on the go. 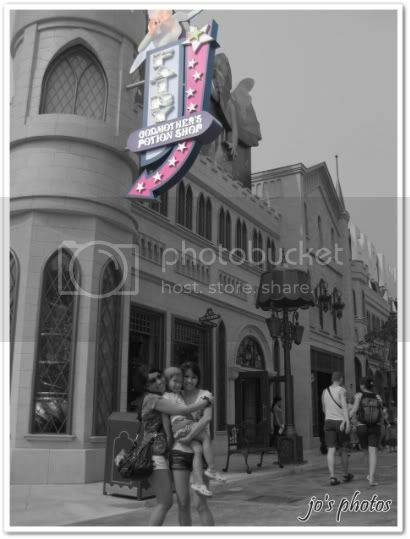 I loved the food there! It's a must try for in-between tummy fillers. 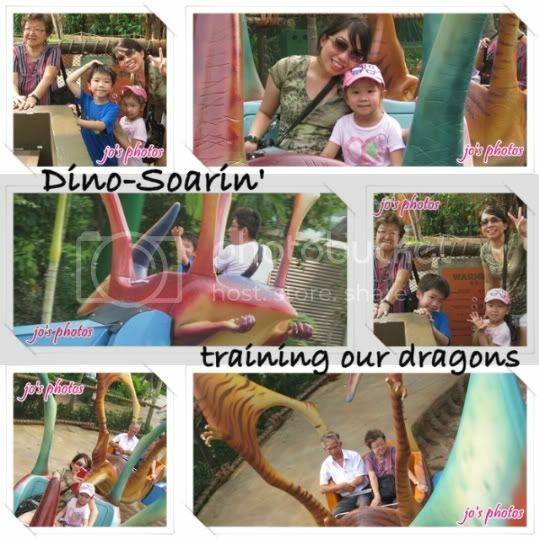 The whole troop of us, including cyn's elderly parents, went on the Dino-Soaring ride which is like those jumbo elephant rides I loved when I was a kid. You could "train" or control your dino to soar up or swoop down and also to make sounds just by pressing the buttons inside. 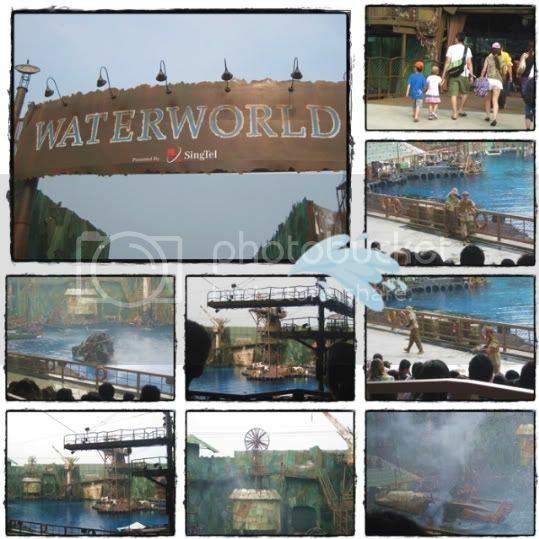 Next, we headed towards the Waterworld performance which is based on the blockbuster film of the same name. 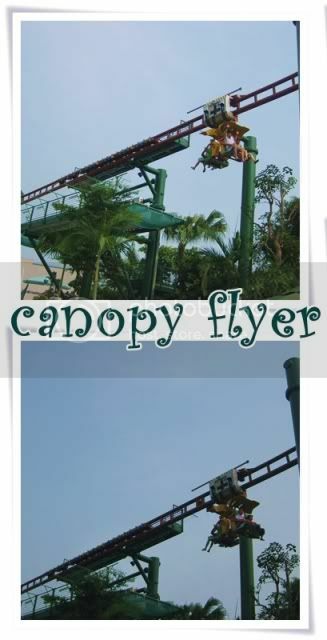 Cyn and her family sat on the Canopy Flyer while kh and I babysat the kids. When cyn's mum got down, her legs were shivering and she swore never to sit on that again while cyn's dad thought it was a "blow wind" ride. 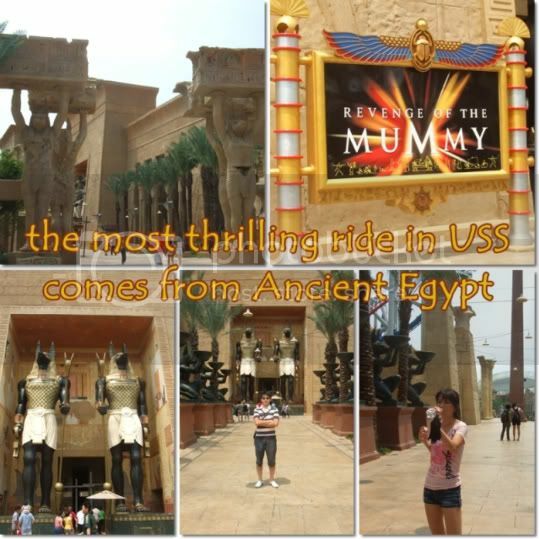 At Ancient Egypt, char was dying to sit on the mummy ride. Unfortunately, she fell short of the height requirement and burst out in tears. Look at her sour face there. 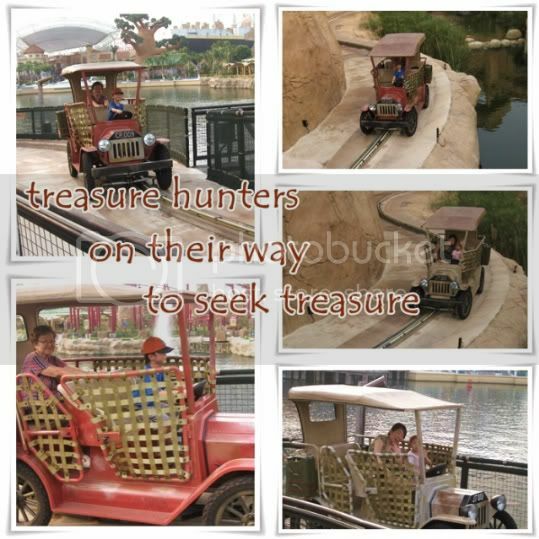 So they hopped onto the Treasure Hunters ride to console her while I stood on the bridge to capture photos. Jase was elated at being able to "drive" the car while po po happily relaxed at the back. 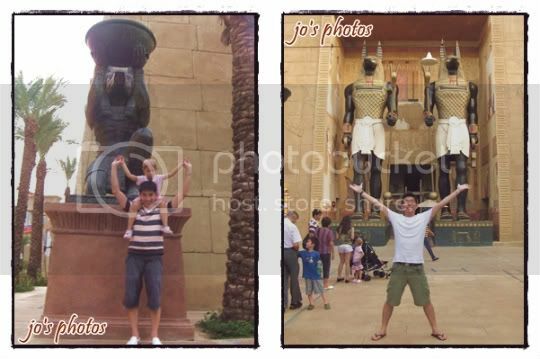 Meanwhile, cyn's bro and dad were having a whale of a time on the Revenge of the Mummy ride. I was in full awe for cyn's dad who is in his mid 60s for being able to enjoy his debut roller coaster ride. 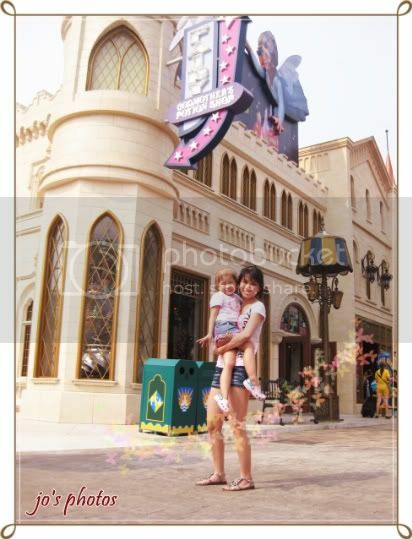 Cyn was dying to try out the ride too so kh offered to babysit and cheer char up while the 2 of us went ahead. Cyn's bro and dad called out to us that they wanted to join us for another round and I was so amused by her dad's enthusiasm. 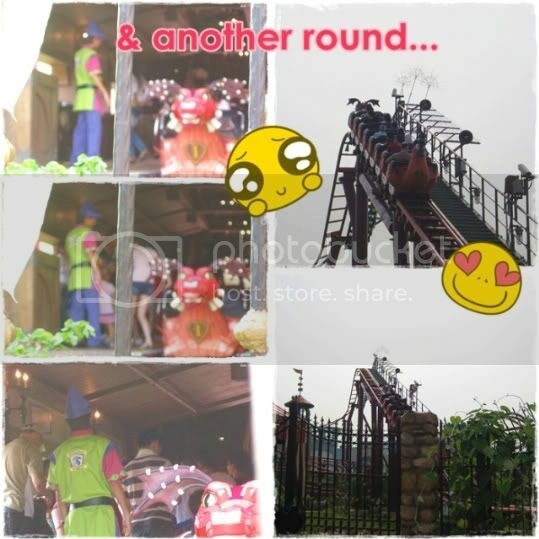 While waiting for our turn, the ride attendant politely reminded cyn's dad that it was a roller coaster ride and before she could continue, cyn's bro said, "Don't worry la. This is already his 2nd time." She had a look of bewilderment written all over her face. We wanted to have our dinner at Discovery Food Court as I read that the food there was not bad. However, it was closed by the time we got there. 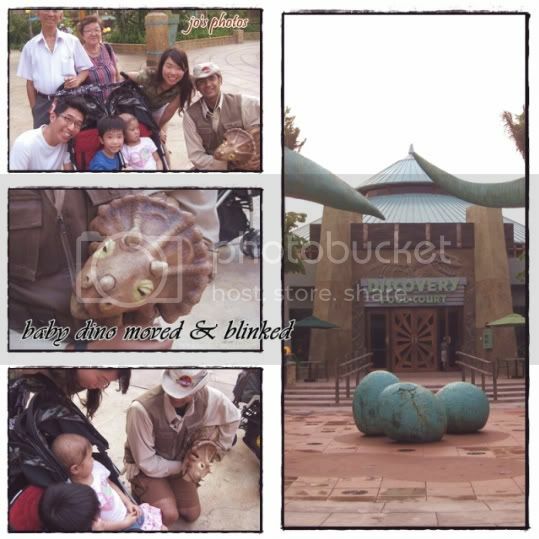 Along the way, we bumped into a ranger with a baby dino in his arms that could blink and move like a real creature! We trawled the various lands in search for dinner but many eateries were closed by then. 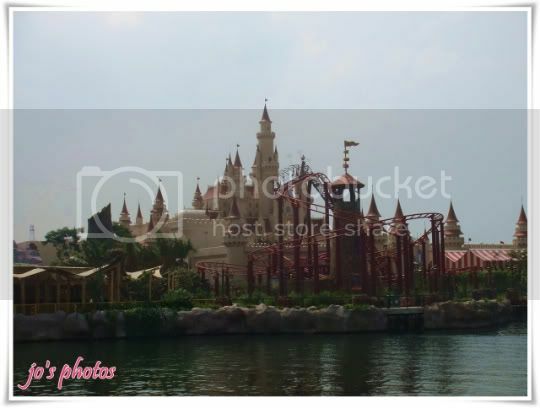 Hence, we ended up taking photos. We eventually had takeaway dinner at Mel’s Drive-in which was also closing and did not allow us to dine in. 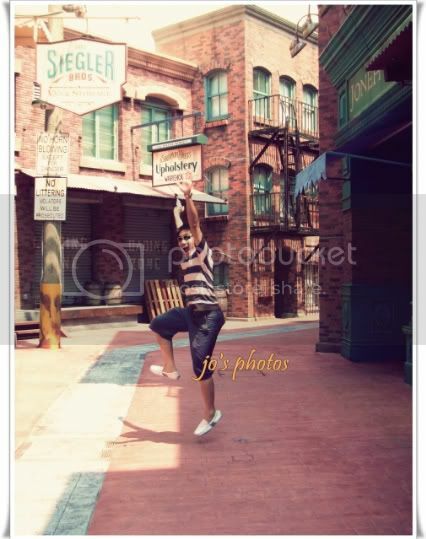 I loved how rock & roll Mel's look and I love the vintage cars outside. 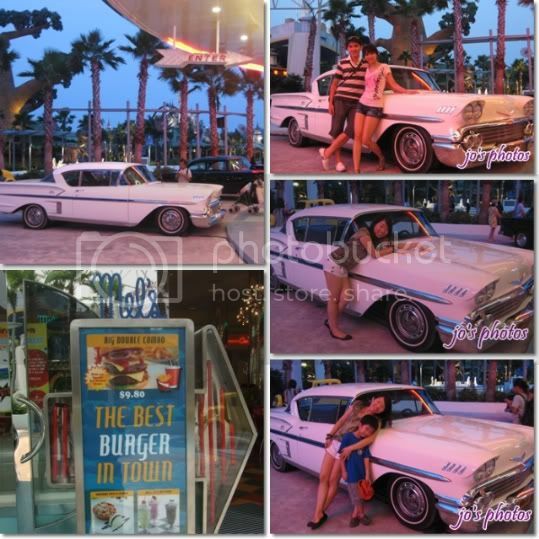 If only we could "drive-in" like how this eatery is modelled after -- a 50s drive-in restaurant. Food was good for fast food standard. The mascots were all very cute and pretty much into character. Gloria the hippo bounced and sprang with heavy steps like how she did in the movie. 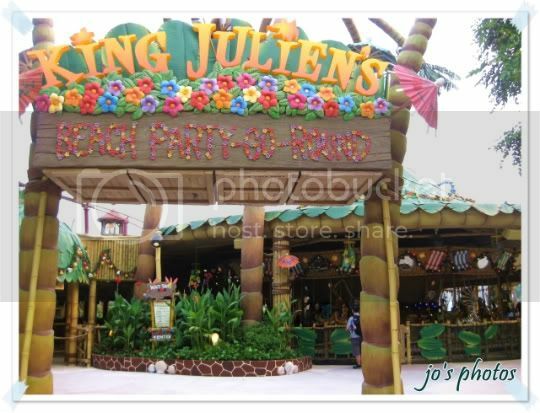 King Julien XIII was the ever goofy and useless king of the lemurs who simply sat back and relaxed on the bench with arms wide open, waiting for people to take photos with him. However, we didn't get to take photos with any of them as the queue was simply too long. 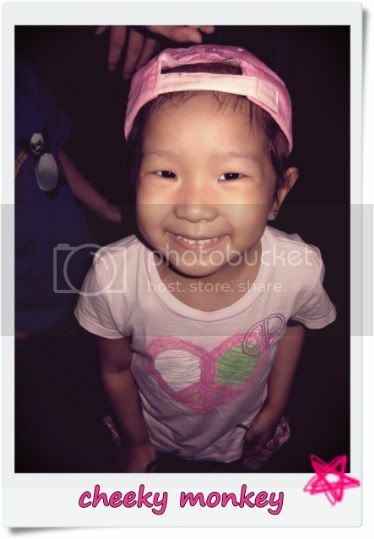 Cutie Jase is very "yang or" and sticky to us always. 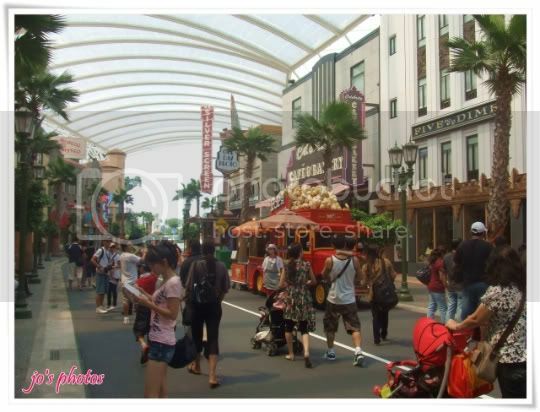 If you're wondering why we kept eating throughout the day at a theme park where food is known for being overpriced, that's coz $10 meal vouchers and $5 retail vouchers were given free for each paid ticket during that month. Pooling our resources together, we simply had to top up a little bit each time we ate. 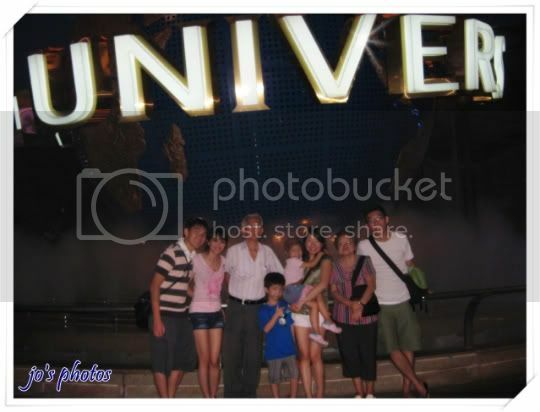 Being a true blue kiasu Singaporean, I simply had to utilise the retail vouchers to their maximum potential. 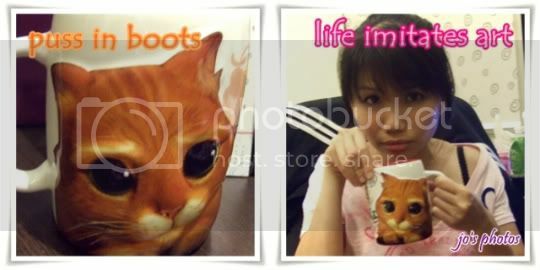 Hence, I combined kh's and my vouchers to buy this cute little puss in boots mug at a top up of less than $2. I had initially wanted a puss in boots tee tagged at size XL for kids but kh declared that he wouldn't wanna be seen with me should I buy and wear that out. I've got lots of mugs at home and at work but none as huge as this. All the better to put my "da bao" drinks from the kopitiam downstairs my office. 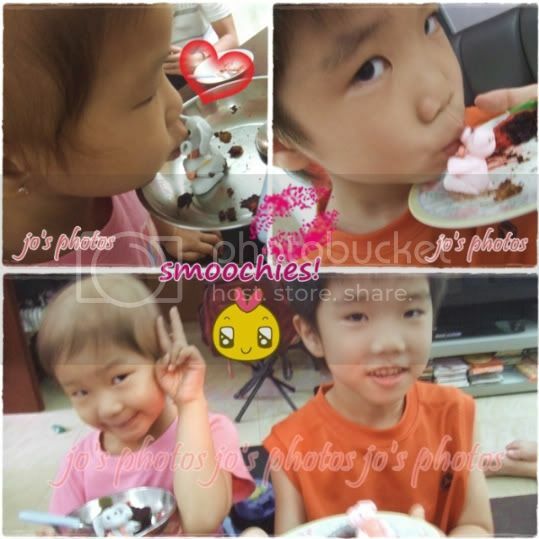 Jase has been such a mature, thoughtful and wonderful brother to charmaine that no matter what the case is, he must be given the same memorable birthday he has always been entitled to every year. 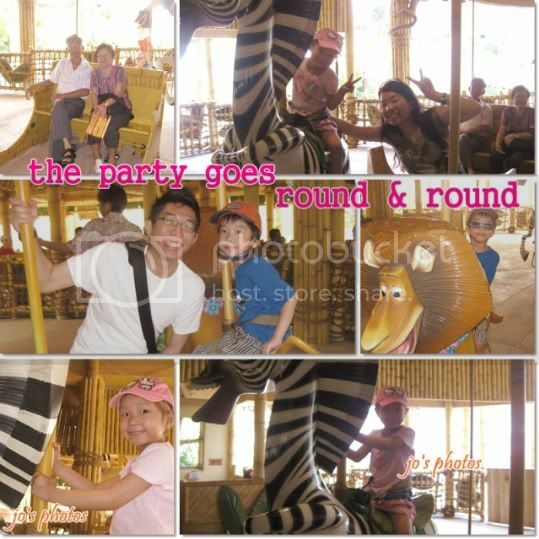 The birthday party was held over a weekend at the function room of one of our common friend's condo. Due to work commitments, by the time kh and I reached the venue, the sun had set and the whole area was aglow with colourful lights from the light sticks. The whole place was filled with excited laughter and shrieks from little kids. The big kids wanna have fun too. And finally the photo-worthy cake was brought out. 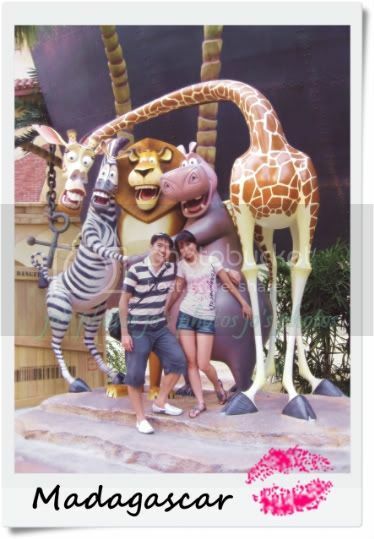 Everyone was frantically snapping away at the lion as if he was some famouse Alex from Madagascar. 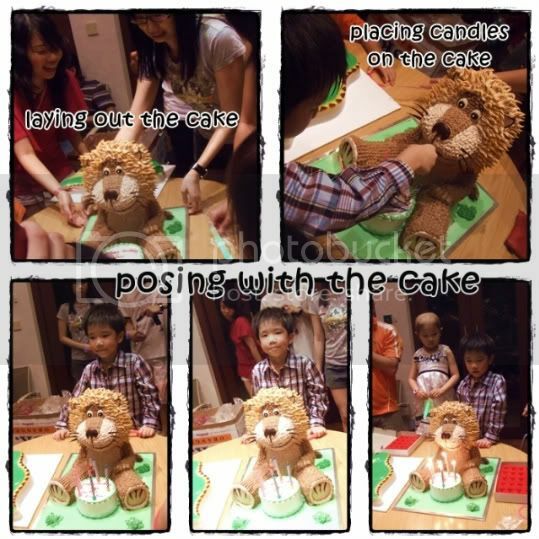 The lion cake looked so cute coz leo himself had got a little birthday cake in front of him. It's as if he's celebrating his birthday too! Jase decided that the best place to plant the candles was on leo's cake. The video below shows how at the end of the birthday song, he was clueless as to how to blow the candles due to the positioning of the cake and hence the candles. Jase wanted Leo's snout and he got it. I kinda thought leo's mouth looked hilarious on the paper plate. 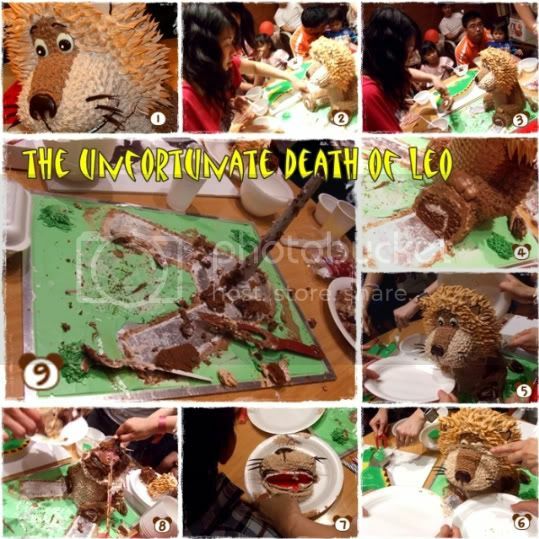 The video below shows the process of dismembering leo. Jase devoured the cake like a hungry wolf while char looked on. 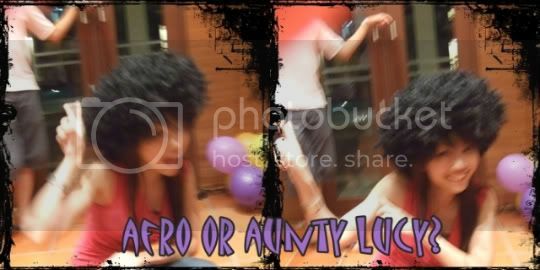 Thanx to kh who dumped this afro wig on me while shooting a video of the kids singing, it brought much smiles and distraction to the people around. Singing Collin Raye's Love, Me. Listen to the lyrics of the song. It's as if the song was written for Charmaine as it aptly describes Charmaine's climb in battling cancer.